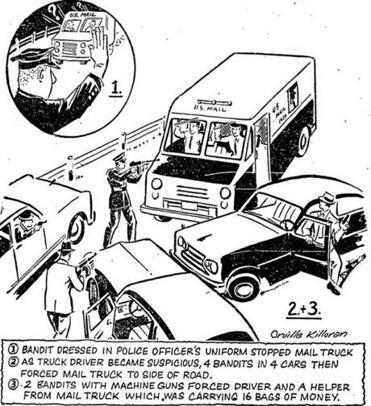 In August 1962, a team of criminals dressed as police officers and armed with guns ambushed a mail truck traveling from Plymouth, Massachusetts, to the Federal Reserve Bank of Boston. Using an elaborate scheme involving fake highway workers and traffic detours, the men got away with $1.5 million in cash — all in bills smaller than $20, and only some of it recorded — in what was, at the time, the largest cash heist in history. The cash, in 16 bags. Had been, picked up from post offices on Cape Cod and was being taken to the Federal Reserve Bank of Boston when the heist occurred. The postal workers were blindfolded, bound and gagged, and put in the back of the truck. One of the men (authorities believe there were six of them) got in the driver’s seat and drove for a while before abandoning the truck with the mailmen still inside. The truck and its two captured occupants were left in Randolph, Massachusetts alongside Route 128. Authorities said the method of operation was similar to that used by two of the FBl’s “10 most wanted men”— Albert Nussbaum of Buffalo. N Y. and Bobby Wilcoxson of Duke. Okla. Both had been seen in the area. The robbery was a smoothly organized crime that went off without a hitch. 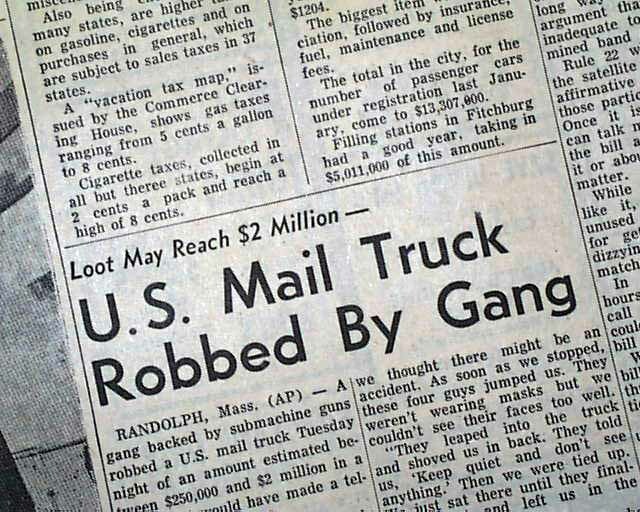 For five years the United States Postal Inspection Service as well as the FBI intensively combed New England for leads in the robbery, but were frustrated at the lack of evidence. Authorities even at one time offered a $150,000 or 10 % of the amount recovered (Federal Reserve Bank of Boston) cash reward in addition to the $50,000 Postmaster General reward for information leading to the conviction of those responsible for the caper, even going so far as to deem any suspect killed in his apprehension to be deemed “convicted” for purposes of the reward. The combination of media, law enforcement, and popular interest in this record-breaking robbery combined for an atmosphere of near-hysteria in the Boston area throughout the early and middle 1960s. Not a few completely uninvolved people were accused of being involved in the heist, with the media loudly proclaiming their guilt even with no evidence or facts to support its claims. 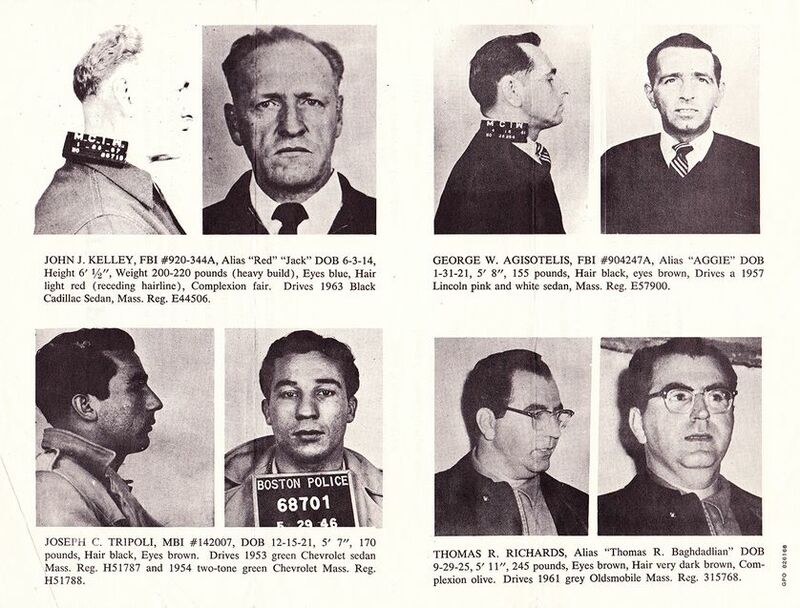 With the five-year federal statute of limitations approaching with no real leads to solve the robbery, the Postal Inspectorate and the Department of Justice stepped up a campaign of near-total surveillance and harassment of all known armed robbers in the Boston area in a frantic effort to obtain clues about the robber’s identities. Shortly before the statute of limitations was to expire, a federal grand jury indicted four men and one woman as the perpetrators of this robbery. One of those indicted just before trial vanished, and has never been found. The other defendants were all acquitted at trial. The $1.5 million in cash (equivalent to almost $12 million in 2013 dollars) has never been found. A Boston mobster, Vincent “Fat Vinnie” Teresa, who was a a lieutenant of Raymond L.S. Patriarca, made the claim in his book called, My Life in the Mafia, that it was John “Red” Kelley who actually planned the robbery. Kelly allegedly got 80 cents on the dollar when the money was finally laundered.